It will contain a new 5 star Moritaka and Gunzou, a new 4 star Gabriel and Shirou, as well as some new units. This gacha specializes in units with the 【恋焦がれる者】 (gives Berserk to self) skill and 【魂を撃つ者】 (deals extra damage to enemies with Berserk on) skill. Note that the gacha simply increases the chances of getting certain characters. It does not contain only them, or guarantee them. 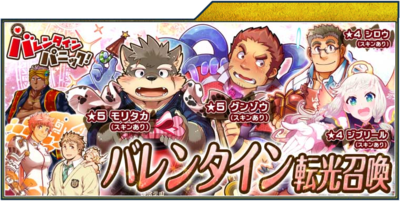 Sitri is a special unit that will be given for free once you participate in the Valentines quests. He is not in the gacha. As you complete Valentines Panic quests, you will receive golden feathers and special chocolates. 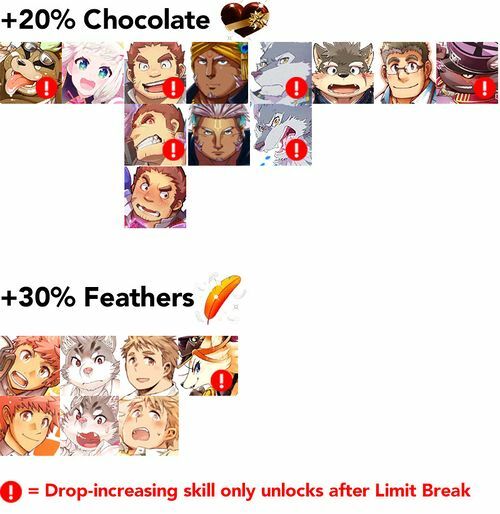 These feathers and chocolates can be traded at the event shop for useful items. The number of golden feathers and special chocolates you receive will increase based on the number of characters with the skills 魂を撃つ者 or 恋焦がれる者 in your team. 魂を撃つ者 increases the number of golden feathers you get. 恋焦がれる者 increases the number of chocolates you get. This includes your Support member. New Valentines quests that are more efficient in receiving feathers and chocolates will be added later. It is recommended you do not waste all your AP/Stamina Drinks for now. This page was last edited on 4 February 2019, at 17:32.